It's hard not to love turtles. They're ancient, for one thing: sea turtles have been around for 120 million years, coexisting with dinosaurs until 60 million years ago. They're vulnerable: almost all seven species are endangered. They migrate enormous distances, and at about 40 years of age, the females return to lay their eggs on the very beach where they were once hatchlings. 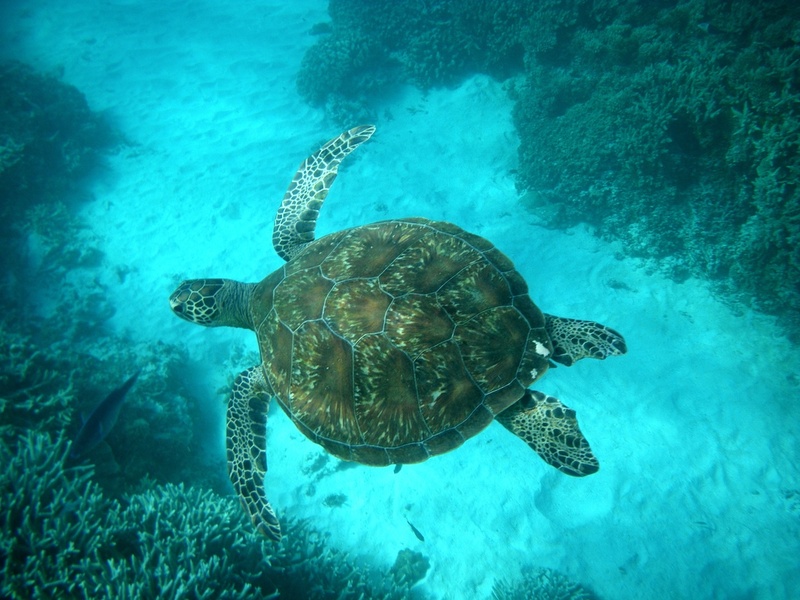 They're the gentle monks (and nuns) of the sea - on Heron Island, at the southern end of the Great Barrier Reef, a few weeks ago, I saw several green turtles quietly grazing, sleeping under rock ledges or swimming in the shallows, the embodiment of equanimity. On previous trips to the island, I'd seen a multitude of nesting turtles hauling themselves up the beach at night to lay their ping-pong-ball eggs in the sand. But I'd never seen hatchlings. Until this trip. One morning, at the completely wrong time of day (sunrise, instead of sunset, when they normally emerge, in near-darkness) my friend Matt and I came across an entire nest of hatchlings breaking free of the sand at once, clambering over each other, in golden morning light, no one else around. I stood right beside the sand nest for a few minutes (Matt was at the water's edge at first, defending a lone hatchling we'd seen moments before, from swooping seabirds) before I remembered to shoot some video, and I've just put together the footage into a short clip to show one turtle's journey from nest to sea. Watching and following a few to the water's edge I was struck by the fact that even in their first minutes of life, they have so much to contend with: sand craters and sticks to climb over and crawl under, silver gulls promising death from above. And they just. keep. going. Each one totally alone, every hatchling for itself. Their mother long gone (she'd laid these eggs two months earlier). Running on instinct. Wanting to live. I give you: a minute and a half of turtle time. Enjoy. Read my first story from the trip on Travel2Next: 10 reasons to visit Heron Island. And big thanks to Heron Island Resort and Delaware North for this trip (which was part work, part prize for a travel writing award). Love it !!!! Just amazing - all the instincts kicking in moments after beginning life. He/she/it should have a name .... anything starting with "super". Thanks, Dad! Nature sure is amazing, and inspiring.